Big Bad China in Africa : Or Western Jealousy? As the anti-China trend in the Western-orientated media grows, stupid names for African countries are appearing, words like Chambia. 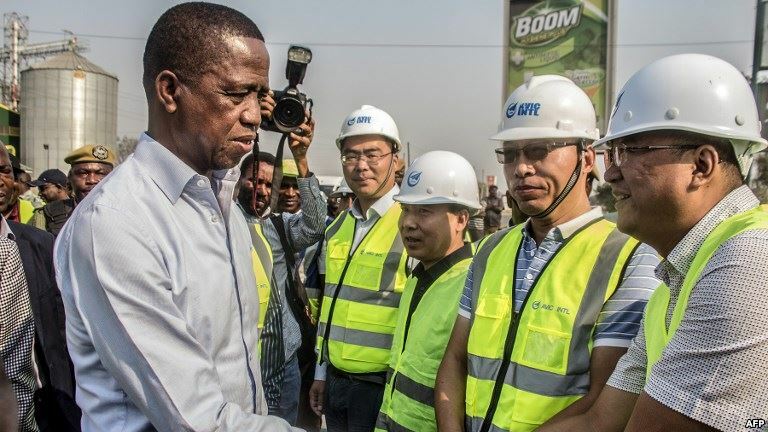 Activists from the Zambian opposition party were protesting recently in Zambia`s capital, Lusaka, against China`s `debt trap` and demanding President Edgar Lungu #sayno2China. They claim that Zambia is so indebted to China that China effectively owns Zambia, hence the label `Chambia`. Apparently these critics don`t like development. They don`t like the modern infrastructure being constructed in Zambia, the airports, railways, factories and roads that are being largely financed and engineered by China. Perhaps they are longing for the good old days of Cecil John Rhodes. The Finance Minister, Margaret Mwanakatwe, put the record straight and told critics that of the total interest paid to creditors in the first half of 2018 only 30% was to China. Leading Zambian economist and head of Zambia’s Private Sector Development Association Yosuf Dodia said that Chinese investment should be seen as an opportunity not a burden. That is the general consensus of African governments who defend the Chinese model. Compared to other creditors ( like the IMF) Chinese banks offer far better terms. The interest is in some cases non-existant or else at very low rates of interest. There are lengthy periods of grace before payments commence and much longer re-payment periods.And unlike Western banks, the Chinese banks are lending, extending credit for the express purposes of uplifting the standard of living of African nations. Last year at the historic Forum for China-Africa Cooperation (FOCAC) in Beijing, Zambia secured a $30 million interest-free loan and a $30 million grant . Yes! You did read that right! Interest free loan and grant totalling $60 million! What debt trap!!!! Are they raving idiots who complain about such an incredible arrangement? Please explain – WHAT DEBT TRAP? Are these people ignorant of Africa`s history? Are they devoid of memory? What has World Bank and IMF policy done for this continent,ever? The City of London`s financial tool, the IMF, has impoverished and pillaged on a scale beyond belief. IMF debt has been part of a masked economic war for decades. Critics of China have pathetic economic vision when they say that China`s mega-projects risk leaving already fragile economies in even worse shape. The development of the physical economy is what has never happened up until now that China is helping African countries to meaningfully develop their economies. And it is exactly the mega-infrastructure that will put those economies on a new trajectory. With their current stategy the IMF weazles are conducting a new kind of masked economic war against Africa. They have a new weazly term for withholding aid! Is the debt sustainable, they ask in their myopic weazly way. Predictably it is being taken up on by civil society groups in the name of human rights.Somehow it is now an abuse of human rights for African governments to get their countries into debt. Debt with the IMF is OK but debt to China is very ,very bad. These critics from opposition political parties and civil society groups are repeating the IMF myopic mantra and saying debt payments are unsustainable, and that China could take over businesses and public assets.Does this say anything about George Soros funding to such groups and political opposition? Xenophobic attacks on Chinese nationals are also on the increase. It would appear that the resentment felt by a few is being fuelled by the same anti-China critics. In other words the xenophobia is opposition run as is evident in a recent article from Xinhuanet which reported a demonstration held by Zambian miners in Kitwe City, Copperbelt Province to protest against opposition politicians who have been inciting xenophobic attacks on Chinese investors. In a spiteful and myopic move the IMF has decided to withhold $1.3 billion in financing to Zambia. “There are currently no discussions on a possible fund-supported program given the authorities’ borrowing plans compromise the country’s debt sustainability and undermine its macroeconomic stability,” said Dhaneshwar Ghura, the IMF’s chief of mission in Zambia. The U.K. has also decided to suspend aid assistance to Zambia in an equally spiteful and myopic move to which they added an untruth which was that previous aid money had gone missing. Since when has any Western banking institution offered an interest-free loan? It is unheard of. And although the IMF cancelled an amount of debt owed by some of Africa`s poorest countries after the Jubilee 2000 Campaign,they had already paid off in interest many times the original borrowed sum. But somehow London and its banking empire made the debt cancellation seem like the most gracious of gifts! Last year at the 2018 FOCAC Summit, China promised a further $60bn for African projects.That was in addition to a 2015 promise to provide African countries with $60bn in funding that President Xi Jinping confirmed had either already been delivered or arranged. In some cases China has already erased a number of loans to countries struggling with urgent social needs such as food shortages. China is doing for Africa what has been an anathema to IMF financial policy. China`s Exim Bank is extending credit for mega-infrastructure projects, for massive development of goods and services. That`s exactly what a bank is supposed to exist for, for the extension of credit for projects that will create progress and the upliftment of a nation`s standard of living. And it is exactly what the City of London-Wall Street banking empire does not do. The Kenyan Mombasa-Nairobi Standard Guage Railway was completed last year, constructed by China in partnership with the Kenyans and financed largely by Exim Bank.It is not just any old railway line. It is state of the art, super modern, super fast, super high tech and super brilliant. All the super smart train drivers are Kenyan and many of them are women. The railway has more than halved the time taken to travel from the coastal port of Mombasa to the capital city of Nairobi. Local economies along the length of the line are now thriving.To serve the passengers and increase in trade, cafes and restaurants are opening, hair salons, shops, super-markets, traders of all discriptions. That`s just local. On a national level, the railway is transforming the economy because goods and services can now operate much faster, more efficiently with direct access from and to international ports directly into the interior of East Africa. And that railway is just the start of something gigantic! As part of the Belt and Road Initiative in Africa, the Mombasa-Nairobi line will be part of a rail corridor to connect all the countries of the Great Lakes and including South Sudan. What on earth is not to love about mega-infrastructure and development like that? And to those who call China a malevolent entity in Africa, do you know that if it weren`t for the Chinese and that railway in Kenya that there would have been another famine in Ethiopia in 2016? The Chinese were the first to get food aid to Ethiopia by constructing a temporary railway . It never made the headlines. China is not just giving emergency food aid ( $147million in last year`s budget) where it is needed, building hospitals, schools and many other social needs. It is helping Africa with the long term solution to basic social needs by providing vocational training, scholarships , the development of skills and not just skills needed to work in factories but high-tech skills, training in state of the art technologies, training engineers, scientists, skills needed for the 21st century Africa. In order to extinguish famine from the continent China`s solution is not to just dole out food aid but it has committed with 500 agricultural experts to assist in the modernization of agriculture with new technologies and innovative practices which to the majority of African farmers are unaffordable. They are unaffordable because the IMF has been wrecking domestic markets with its policies. There may not always be such visionary leadership as there is in President Xi Jinping, an individual who exudes dignity of purpose, but we need to think that China is not just building economic development on a global scale. China is developing an ethos that is an anathema to what is still current thought in the West. That we can all live in the same world and co-operate with each other for mutual economic benefit instead of being at war. Xi Jinping said “What we hope to create is a big family of harmonious co-existence. ” That `big family` is based on another value which has become an anathema in the West, the respect of the national sovereignty of nation states. Between 1970 and 1980, Africa’s foreign debt rose to $89 billion. According to UN Commission on Trade and Development (UNCTAD), between 1970 and 2002, Africa received $540 billion in loans, and repaid $550 billion, and yet today, its debt is still of $295 billion. Studies by the Committee for Cancellation of Third World Debt (CADTM) showed that in 2012, Sub-Saharan Africa returned to the world 5% of its GDP (in investment profits and debt service), while development assistance only accounted for 1% of the same GDP.